Stitching is one of those things that is fundamental to leatherworking, and is pretty hard to explain through text. So, I figured instead of trying to explain everything through writing, I'd switch it up a little and throw a video in this time! If you don't know how to stitch leather yet, this video will walk you through step by step. And if you've already learned to saddle stitch but aren't 100% happy with how it looks, I'd encourage you to still check out the video because there's some tips in there for you as well. SO WHAT'S A SADDLE STITCH? Saddle stitching is the most popular way to sew leather by hand, and it's for good reason too. It is one of the most durable ways to stitch leather because it locks at every stitch you make. This way, if the thread breaks somewhere, only one stitch will come undone, as opposed to the entire line of stitching, like it does with a machine stitch. You can see how the thread locks at every stitch in this image below provided by Kinz Leather. 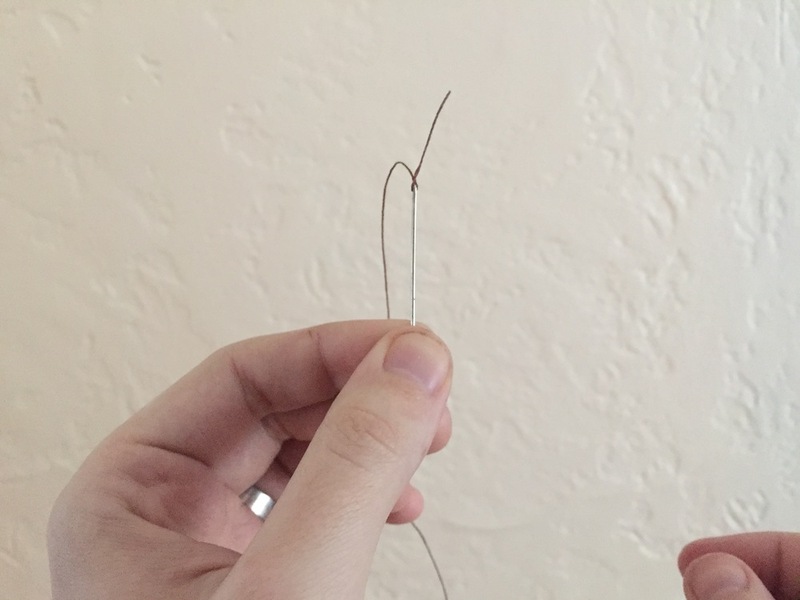 Before we jump right into stitching, let's first talk about how to thread your needle. It's nothing too hard, but here's some pictures to start off on the right foot. First cut a piece of string that will fit your needle. To determine the length of string you need, measure the stitching line of your project and multiply by 3.5. On smaller stitching lines (less than a foot) multiply by 4 to 4.5. Pull the string through the eye of the needle. Continue pulling until the thread rests 1 to 2 inches beyond the end of the needle. Keeping 1 to 2 inches of the thread beyond the point of the needle, pierce the thread with the needle. Try to make sure that the needle has an equal amount of strands on either side. Pull the thread that was just pierced back beyond the eye of the needle. This will create a knot. Pull from both sides of the thread to finish creating the knot, making sure to pull tight so the knot is secure. Now just slide the knot to the top of the eye and you're ready to begin saddle stitching. This tutorial assumes that you've already created your stitching holes. To make sure that your make your stitching holes nice and straight, check out this post! And that's it! Like I said, not that hard, right? Let me know what you think of the video, and please let me know if I can do anything to make it more helpful for you! If you'd like to learn about something else that would be best learned in video form, drop a suggestion in the comments below.